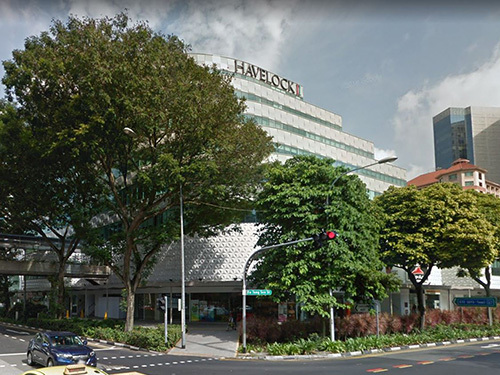 Located near Clarke Quay, it is a small mall with the usual F&B stores, supermarket and some retail shops. 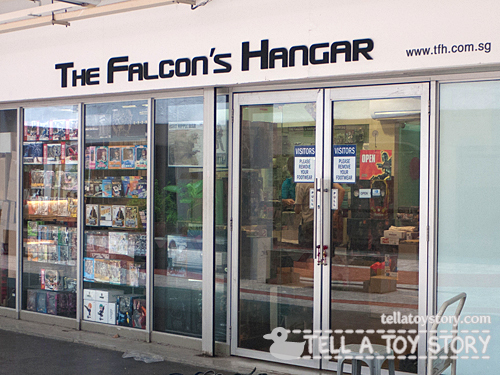 The Falcon’s Hangar started off in Katong Shopping Centre selling Starwars merchandise and memorabilia. Then they moved to Far East Plaza for a few years and now they have a large shop at Waterloo Centre. It’s very cozy and they have a small TV lounge area for chatting and catching up on toy news with fellow toy lovers. They offer competitive pre-order prices for Hot Toys, Enterbay and other imports of 1/6 figures such as Very Cool, Phicen, MC Toys, Asmus Toys, Triad Toys, ZC World, ACI, etc & Japanese anime toys. The hangar crew is a friendly bunch and they are always happy to chat with you on anything toy related. The 5th floor of Funan DigitaLife Mall (used to be called Funan Centre or Funan IT Mall), just below Challenger Superstore which occupies the entire 6th floor, houses several popular toy shops. (Shifted to Suntec City Mall) Latendo, formerly from Sunshine Plaza, has an impressive cabinet display leading to the inner part of the shop. The right side of the shop has many more displays and you can admire the Hot Toys and Figmas that are posed beautifully in the glass cabinets. I have not purchased anything on pre-order from them before, only gotten a few items from clearance sales and such. (Shifted to Bugis+) Rapid Culture, very popular for its trading cards such as Cardfight!! Vanguard, Bushiroad, Crusade TCG and Gundam War Nex-A, etc, and Japanese goods, hails from ex-Peninsular Plaza, Cine Leisure, Funan and now Bugis+. They organize monthly card tournaments in their shop and sometimes larger scale ones at public venues. The owner, Yanjie, travels to Japan for stock picking a few times every year and he will ask customers to send in their requests to scout for specific merchandise at reasonable budgets. (Shifted to Bugis+) Battle Bunker, specializes in table top miniature gaming: Warhammer 40K, Warhammer Fantasy, Fantasy Flight Games, Paizo, Star Wars X-Wing, Netrunner, Munchkin & more. I have not patronized from them before but I enjoy admiring the intricately painted figurines in the shop window. I only know of one shop here, which is Robo Robo. 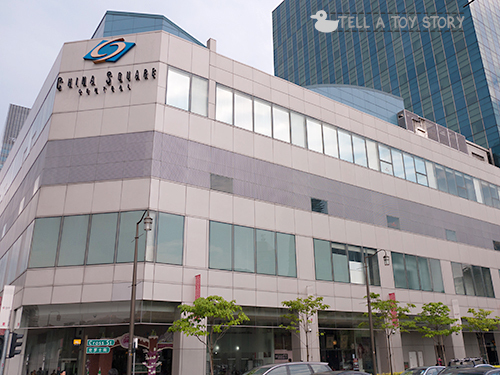 The shopping centre is right next to Funan DigitaLife Mall, so you might wanna drop by along the way. Owner Gerard sells an assortment of Takara Tomy Transformers, Hot Toys, RAH, Bandai, Figmas and Nendoroids. 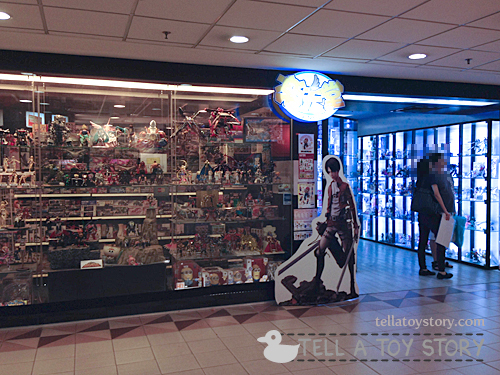 Simply Toys is the official distributor for Sideshow Collectibles in Singapore. 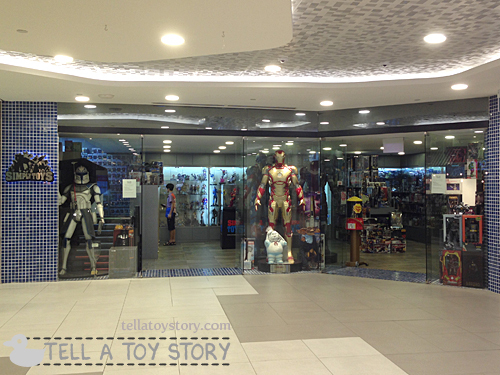 Their showrooms at Plaza Singapura and Bugis Junction are a joy to browse as they frequently feature life-size movie props from Terminator, Starwars and Marvel / DC, etc. They also carry Kotobukiya goods such as statues, bishoujo and Cu-Poche, which is similar to Goodsmile’s Nendoroid series. Look out for their member specials for better prices. 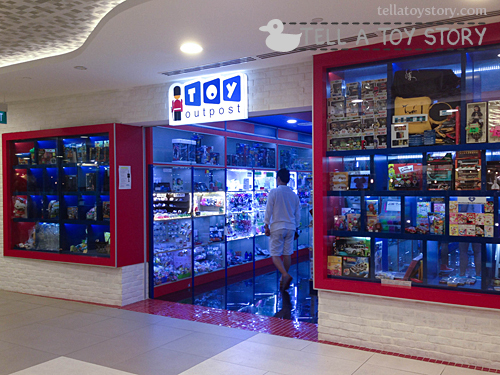 Toy Outpost & HAKO are spin-offs from the company featuring rental cabinets for the budding seller to display their goods for sale on consignment. Funko Pop, featuring an amazing range of vinyl collectibles with licences from just about every movie, cartoon & pop culture franchise, can be found at Simply Toys and Toy Outpost. Official store, Pop Life, at Wisma Atria. You can pre-order upcoming Funko Pop figures here as well. Valore by Challenger also stocks Funko Pop figures. There are outlets at shopping malls such as Tampines Mall and Parkway Parade. 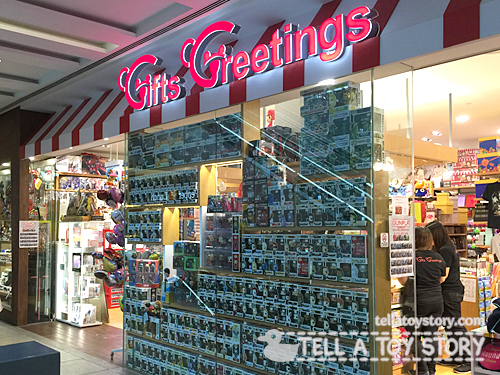 Gifts Greetings, which specializes in party goods such as balloons, cards & decorations, also sells Funko Pop and carries some anime figurines. G&B Comics is a comic shop catering to western comics, graphic novels and merchandise. You can find DC / Marvel statues and movie collectibles here. Absolute Comics is another comic shop that sells western comics, t-shirts, specialty games, and action figures. Located at Plaza Singapura shopping mall. PLAYe has acquired Funz Centre, Zepy and GameExtreme in 2016. The writeup about the original stores below has been amended to reflect this. 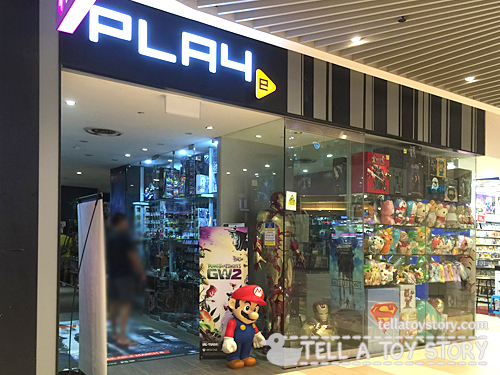 Funz Centre, which also goes by a new name, PLAYe, is a gaming shop which started out in Ang Mo Kio neighbourhood. It has since expanded into a chain of shops with outlets in Bedok Mall, Katong 112, Orchard Central, White Sands, Vivocity, etc. Great for console/PC games and of course, toys. Each of the outlet is lined with display shelves featuring very interesting items for your browsing pleasure. A few of the larger outlets such as the flagship in Orchard Central even features life-size figures such as Iron-man and Super Mario. They have friendly and knowledgable staff who will be happy to chat and recommend the latest games to you. Check out their FB page for outlet information. Update Jul 2016: Qisahn has joined PLAYe and now comes under the same chain. Update Dec 2016: Qisahn has opened a new store and is operating on their own again. 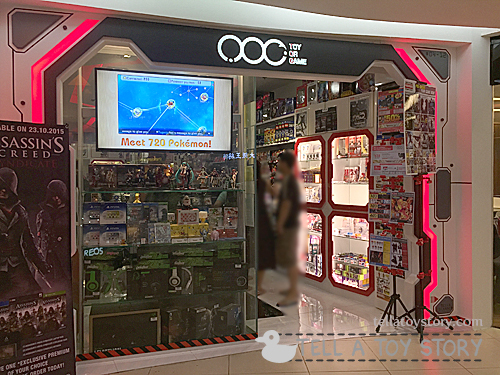 Qisahn is a gaming shop with the only outlet in Far East Shopping Centre. They offer very competitive prices for console and PC games as they import the goods from overseas by themselves. They now carry a selection of toys including Nintendo amiibo. Depending on your luck, sometimes they upgrade your pre-ordered game from a normal edition to a limited/collector’s edition for free! They offer shipping services for online purchases to Singapore and Malaysia addresses for a small fee. Toy or Game is a relatively new chain that has taken over the outlets previously occupied by Comics Connection. Check out their pre-orders for Hot Toys, Play Arts and Goodsmile products. Visit their FB page for outlet locations. Hobby Art Gallery is scale modeling shop popular for their Gundam model kits. Located at Sunshine Plaza, they offer everything related to hobby and modeling for Gunpla fans. This shop, Let’s Play, at Sunshine Plaza stocks mainly Tomy Takara / Tomica diecast cars and other toys. 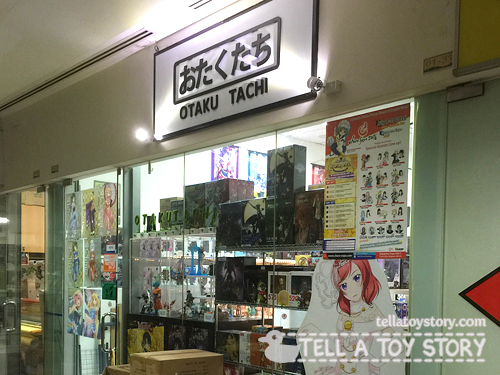 One of the anime shops, Otaku Tachi, at Sunshine Plaza. 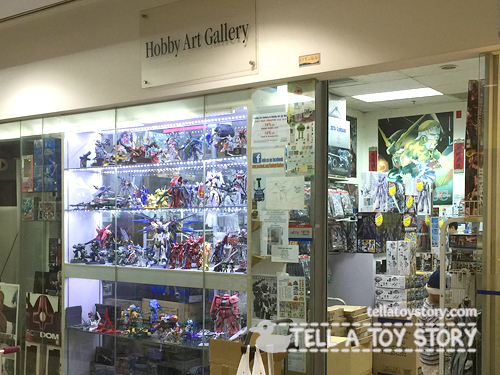 Hobby Hub SG is also popular for their Gundam. They have frequent promotions so check out their FB page. Looking for Nerf, Mattel, Hasbro and Disney goods? You can find them in these departmental stores. 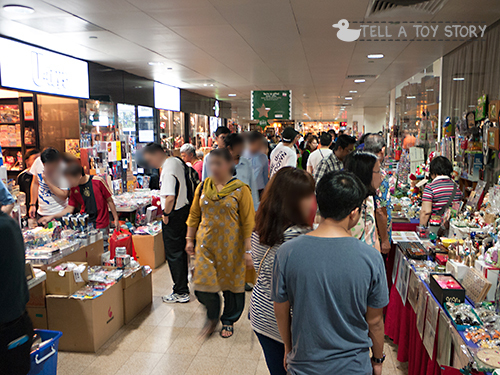 Takashimaya holds a twice-annual toy fair at the Ngee Ann City atrium, usually in June and December during the school holidays. Look out for them for general kids toys at clearance / dumping prices! 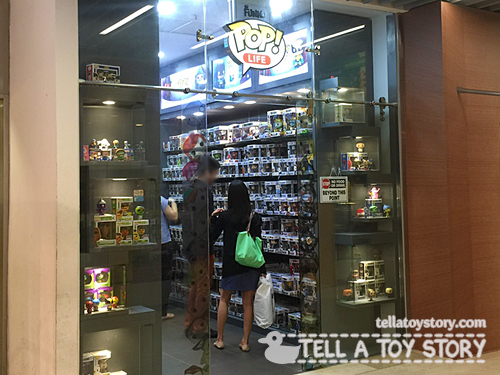 Hope that this post has helped you to plan your shopping trip and increased your understanding of the Singapore toy retail scene. Happy toy hunting in Singapore! Do leave your comments on your finds! 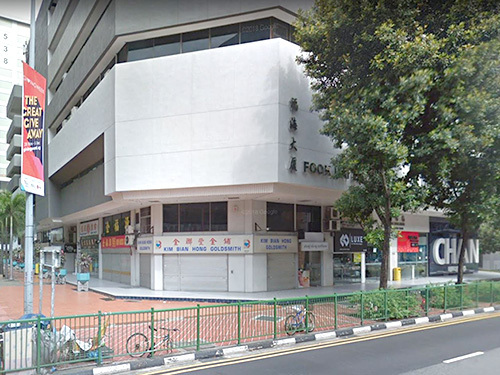 China Square Central or simply CSC, sits in the heart of Chinatown and is very accessible via the MRT (Chinatown Station on the Northeast Line) or via private transport (just off Shenton way). 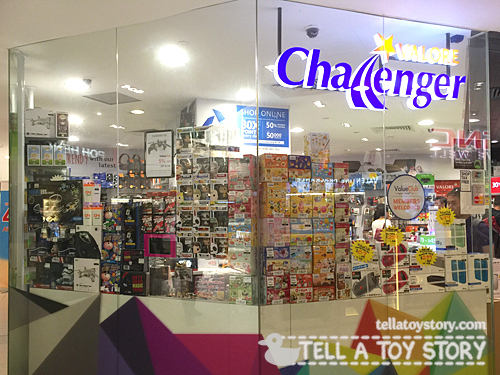 It has the highest concentration of toy shops in Singapore. There are 2 floors of indoor shops and eateries along with an office block. The toy shops are open everyday but there are hardly any shoppers on weekdays. What is interesting about CSC is their Weekend Flea Market, which incidentally only runs on Sundays from around 11am to 5pm. More details on this can be found on the official mall page: Sunday Flea Market at CSC. Every Sunday, the mall comes to life with no less than 50 flea market stalls operating in addition to the brick & mortar shops. This is the best time to grab vintage toys, hard to find collectibles and even the occasional antiques such as old watches, cameras, ornaments, coins, notes and vases. You will be able to find 2nd-hand toys as well as new ones being off-loaded by long time toy collectors / sellers. 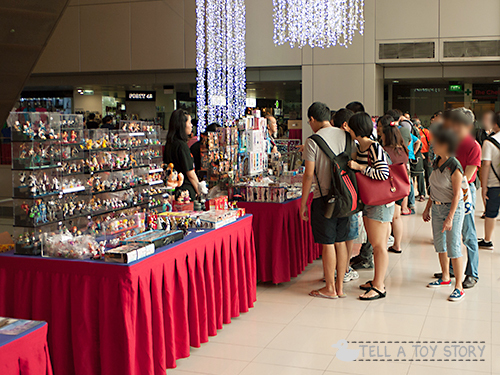 Many of the toy sellers actually hark back to the good old days of the weekend flea market at Clarke Quay so they have regular customers to catch up with every Sunday. 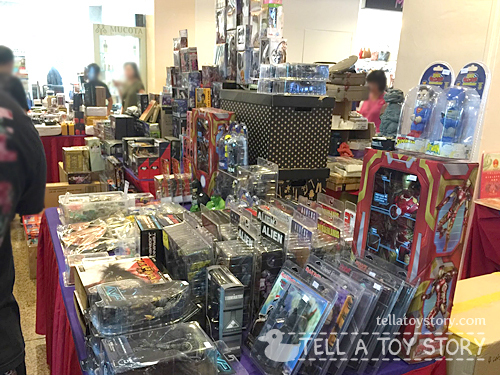 A closer look at Masak’s stall on a typical Sunday: NECA toys galore! The latest 1/4 scale NECA, NECA bobbleheads & scalers from Marvel, NECA movie figures from Aliens, Predator, Terminator, NECA mego style such as Freddy & Jason and NECA ultimate figures (e.g. Evil Dead Ash). There are also life-size WWE belts as well as scaled versions for 6″ figures. Right beside this stall, you should be able to find Animate Corner for all your Japanese toys fix. Both of these stalls are usually located in front of Toy Realm on Sundays. Can you point me to a store that sells Choro Q/Choro Q Zero? Try you luck during the flea market at CSC on Sundays. Could you please advise where I can buy traka cross fire b-daman in Singapore? If you are referring to Takara Tomy Cross Fight B-Daman, you should be able to find them at Toys R Us and Takashimaya (Ngee Ann City). hi, would u know wer I can buy super Mario figure collection and also angry birds go jenga tower knockdown game and pirate pig attack game? toys r us don’t have them.. I have seen super Mario figures for sale at Funz Centre (PLAYe). You can call the outlets to see which one still has it. Not so sure about angry birds jenga though. 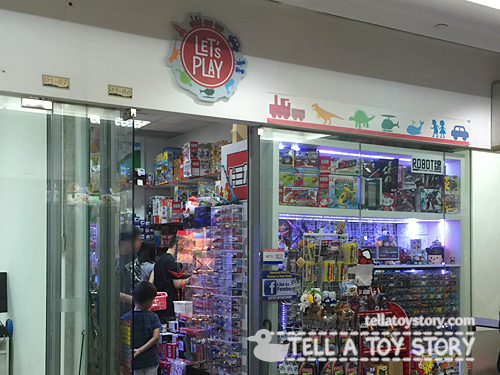 Thank you for writing this great article, my history of toy collecting and buying really began when I made my trips to Singapore over 10 years ago when there were bustling toy shops over at Clarke Quay. 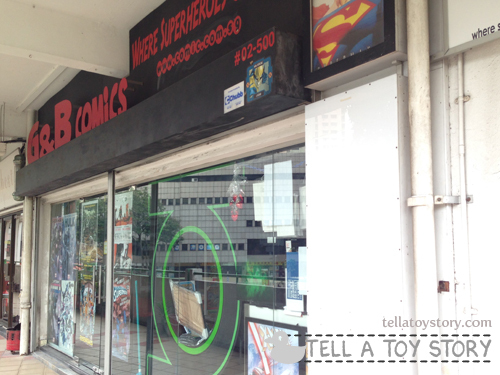 Sadly however, when I came back to Singapore in Sep 2015 I have discovered that most of the toy shops in CSC have closed down – except for a few like Vincent’s, Simply toys, Toy Outpost with a few branches and Toys or Games (ToG). Old standouts like U-Toys were completely gone. Any idea on why they’ve closed down? U-Toys is now at Fook Hai Building, unit B1-26. I have not been there yet. I went to take a look end of Feb 2016 but could not find the shop. From McFarlane? Try your luck during the Sunday Flea market at CSC. Hi..may i know where can find the cheapest wwe mattel figure? WWE figures can be found at CSC fleamarket on Sundays and also at Toy Outpost outlets. Hi, do you know where to buy s.h.figuarts figures with a decent price? Is it available at Takashimaya? Takashimaya usually sells them only during the midyear or end year craziest toy fair. Anyone know any website to order WWE in singapore or else? He has some WWE for sale but I’m not sure if there are new stocks. Toys at CSC are of a large variety so while most are legitimate, I have also seen bootlegs occasionally so you have to be discerning. Both new and second-hand toys are available. For Kotobukiya, you can try Simply Toys as they are the official distributor. Hi. I’m from Msia. If I make a day trip to Spore, where is the best place to buy Star Wars figurines from Kotobukiya, Hot Toys and Sideshow? How about other premium Star Wars collectibles like Black Series & Force FX? 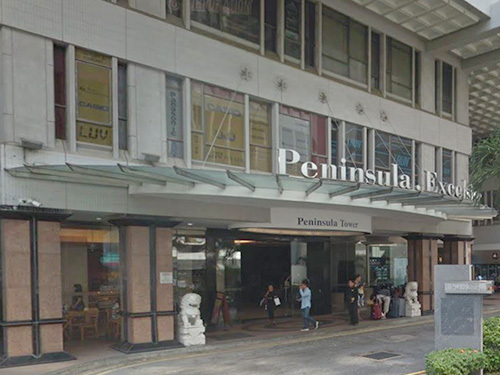 Hi, im trying to find military figurine, namely bomb squad and EOD, I have tried China square, funan and plaza Singa and waterloo Anyone know of other place. Thank you in advance. You can try calling them. Hi there! Appreciate the mention on your website! Please drop by and say hi when you’re free on Sunday, a small gift is waiting for you, thanks! Haha, no problem at all, didn’t expect you to find my website. See you soon when I collect my pre-orders from you. Hello, I’m from Indonesia, would you inform me where I can find shops for Saint Seiya figures? You can find Saint Seiya at China Square Central (CSC). I’m looking for a second hand items like scrabble, Jenga block , Checkers game board & seed or others suitable games, it must be in good conditions for my patients activities program. Have very low budget on it. Do visit the flea market at CSC on Sundays. Some stalls sell second-hand goods. Hi! I’m in SG right now for a short trip. I’m looking for marvel legends figures preferably loose. Thank you in advance! If you are available on Sunday, do drop by China Square Central (CSC) and visit the flea market. Good luck! Hi! Thank you for your response. I’m afraid I won’t be able to find time on Sunday. For toy outpost are they also collectors selling their figures? I’m also trying to score some MOC figures an that Marvel Universe Galactus. Flea markets are open only on Sundays? Thank you again in advance. Toy Outpost is using rental cabinets, meaning sellers will leave whatever goods (new or loose) they want to sell in the cabinet and the shop will take care of the transactions for them. This also means the goods are random and unpredictable. Every outlet will have slightly different variety. The goods range from handphone accessories, to makeup and jewelry, to toys, etc. The flea market at CSC is open on Sundays only. There are just a few permanent toy shops there which open almost daily if you want to check it out. Nice! I’m really hoping to get some legends figure. Thank you so much him! Hi! Anyone know where I can find Kuroko figures in Singapore, specifically a Tetsuya No. 2 plush? Thanks for the post, I usuallu visit Sunshine Plaza when I come to SG, but now I’ve started to collect a new toy line called the Gundam Converge by Bandai. Does anyone know a nice place to hunt for them? it’s been a while since I last visited SG. Thanks in advance! Do you now where I can find Takara Tomy Masterpiece Transformers at a reasonable price? Like for example, MP-13 Soundwave figurine. Yes, I have seen Sailor Moon at CSC, you can try your luck there. btw, do you know where I can find zoids? especially old edition-battery/spring operated zoids? Hi, you may want to try your luck at CSC on Sundays. There is a shop on the 2nd floor behind the escalator selling gashapon packs and a couple of flea market stalls may carry it too. Hi! Do you know where I can find Power Rangers Mighty Morphin toys? Thank you! You can try Toys R Us or CSC on weekends. I have quite a few Mcfarlane SPAWN collectible figures which i would like to sell. Do you know of anywhere which i can sell them? Thanks in advance. Carousell is a popular online platform for selling toys. You can also consider checking out the Sunday flea market at CSC and get a table. Hi, I’m just wondering, where can I find Takara Tomy’s Masterpiece Transformers line? I’m looking for MP-36 Megatron specifically . Also Takara’s 10th movie anniversary line, MB-11 Optimus Prime specically. Thx! Hi, do check with either RoboRobo or TFH. Contacts are in my post. Hope to see a article on digital games besides toy and game shopping in Singapore? Thanks for the suggestion. I might do it one day. For now, you may purchase digital wallet cards such as Steam, MapleStory, PSN, Xbox Live, etc, from shops such as TOG and ePlay. Hi , where can i find a 2.75″ Wonder women and Flash action figure? Please try CSC flea market on Sundays. Best chance to find vintage toys from the 1980s would be during Sundays at the CSC fleamarket. any recommendation where to buy gashapons and candy toys in singapore? You can find those at TOG (Toy or Game), PLAYe, or try your luck at CSC flea market. Hi, any recommendation where is the best place for McFarlane or Neca figure? I am looking for some alien figure in Singapore..
Masak from CSC brings in NECA Aliens, do check out his stall on Sundays or his Carousell listing for availability. If you are looking for older releases and don’t mind higher prices, Simply Toys usually has stocks of those. Hi, any idea on the best place to buy one piece WCF figures ?